LUXEMBOURG - The scene greeting us at Café des Artistes could have been in Paris, Berlin, Amsterdam, or any number of European hot spots. In a dark, smoky room, a chanteuse, young and lovely and with a world-weary voice, sat perched on a high stool by a piano. The requisite cigarette in hand, she warbled the timeless refrain of "La Vie en Rose" to an appreciative crowd who piped in during the refrain. But this wasn't one of those storied European capitals. This was Luxembourg City, the button-down capital of one of the continent's smallest countries of the same name, and a place better known for banking and commerce than Bohemian-style nightlife. As the evening continued, and the Piaf repertoire gave way to German, Italian, Spanish, and English-language tunes, the connection between this classic slice of evening life and modern day Luxembourg became more apparent. This small city of 76,000 people in a country with fewer than 500,000 is keeping its link to the past; its national slogan is "We want to remain what we are." Yet, to stay relevant, it must build on its international role as a key member of the European Union. For a visitor, this duality translates into a city that's both sophisticated - witness the well-heeled shopping district lined with high-end boutiques - and down to earth - check out the lively pub scene. Luxembourgish is the nation's official spoken language. But French and German are used for written communication and are spoken by many residents. Thanks to new high-speed train service from Paris, you can easily have a taste of Luxembourg after a two-hour trip. A long weekend is plenty of time to take in its important sights on a side trip from the City of Light, a stop on your way to Germany, or a base for exploring the lovely countryside of the Ardennes. Storybook is the word that comes to mind when taking in the city, whose walkable Old Town of stately painted buildings and narrow, winding cobblestone streets commands a dramatic perch overlooking scenic valleys and gorges. Luxembourg traces its roots to a fortress raised by Count Sigefroi in 963 as the centerpiece of what would become the modern day grand duchy, now a constitutional monarchy. Many foreign invaders tried to control this prime territory over succeeding centuries, and it wasn't until 1867 that Luxembourg gained full independence. Overrun by the Germans in both World Wars, Luxembourg ended its neutrality in 1948 and figured prominently in the founding of the European Union, which maintains a large presence here. Today, Luxembourg has become the nation that could: It boasts the highest-per-capita income of any EU member. This wealth is readily apparent in the bling of the Old Town's compact, pedestrian-only shopping district, whose famous names include Hermès, Cartier, Tod's, and Villeroy & Boch. Where there are chichi shops, there must be cafes and pâtisseries, and Luxembourg doesn't disappoint. One of the best is Wenge (15 rue Louvigny, 011-352-2620-1058, wenge.lu), whose sleek chocolate brown and lime green ambience doesn't upstage the luscious chocolate eclairs, macaroons, and other fine pastries. Fortified, you should have plenty of energy to continue exploring the Old Town's handsome Place d'Armes; the Palais Grand-Ducal, used by the current ruling family for official functions and open for tours; Cathédrale Notre-Dame, a reminder of the Roman Catholic faith of nearly 90 percent of all locals; and several small museums, notably the Musée d'Histoire de la Ville de Luxembourg (14 rue du St. Esprit, 011-352-4796-4500), which puts its 10th-century origins in perspective. On Wednesdays and Saturdays, peruse the fruit, veggies, and baked goods at a market on Place Guillaume II and marvel at some of the "boutique" offerings (certain exotic mushrooms sell for more than $30 a pound). In the warm weather months, you can explore miles of underground tunnels at the Bock Casemates (Montée de Clausen, 011-352-222809) and Petrusse Casemates (Place de la Constitution, 011-352-222809) and afterward reconnect with the sun at any number of outdoor cafes. Marking a bold link between old and new Luxembourg is the Pont Grand-Duchesse Charlotte. Crossing its span from the Old Town, you'll arrive at the Kirchberg Plateau, the site of a series of modern blue glass buildings housing the European Union Court of Justice, European Investment Bank, and other EU offices. This area's orderly plantings and general lack of people on the streets remind some friends, who are longtime residents, of "The Truman Show," the 1998 Jim Carrey film about a town that exists only for TV. Still the Plateau is worth seeking out. Here, you'll find the Musée d'Art Moderne Grand-Duc Jean (3 Parc Dräi Eechelen, 011-352-4537-8522, mudam.lu), a soaring contemporary space designed by famed architect I.M. Pei. After perusing the museum's small holdings, which are not yet as distinctive as its architecture, take a stroll around back. Compare the facility's modern lines with an adjacent ancient stone fortress. You may return to this part of the city at night, if the nearby Grande-Duchesse Josèphine-Charlotte Concert Hall, home of the Philharmonie Luxembourg (1 Place de l'Europe, 011-352-2632-2632, philharmonie.lu), is offering a classical or jazz performance in the distinctive, glass oval building. Both facilities were completed for 2007, when Luxembourg was designated that year's European culture capital. If you're looking for a reality check, you'll find it in Hamm, an area in the city and site of the 50-acre Luxembourg American Cemetery and Memorial (abmc.gov/cemeteries/cemeteries/lx.php). Crosses mark the graves of more than 5,000 US soldiers from World War II, many of them killed in the Ardennes offensive, better known as the Battle of the Bulge. Set apart from the sea of stark white crosses is an equally simple grave for an outsized figure in US history, General George Patton, whose Third Army was based in Luxembourg. Patton died in December 1945 after a car accident in Germany, but wanted to be buried with the members of his Third Army. There is perhaps no better example of Luxembourg City's charms than the Grund, a neighborhood of small-scale houses set in a valley, whose sleepy daytime attitude gives way to a considerable bar scene by night. Here is yet another example of how old and new coexist peacefully: L'Abbaye de Neumünster (28 rue Münster, 011-352-262-0521) is a former monastery that serves as an arts center with changing exhibits, concerts, and a brasserie offering a popular Sunday jazz brunch. It was also in the Grund where I spent that memorable evening at Café des Artistes (22 Montée du Grund, 011-357-461-327), with the songs set in Paris ("Les Champs Élysées") and other places far grander than Luxembourg going long into the night. 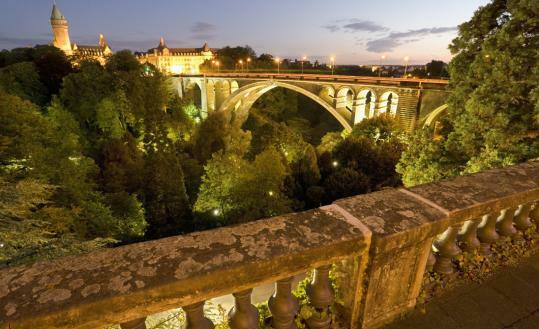 You'll always have those other cities, so why not experience Luxembourg. Robert DiGiacomo, a Philadelphia-based writer, can be reached at robcomo@aol.com.